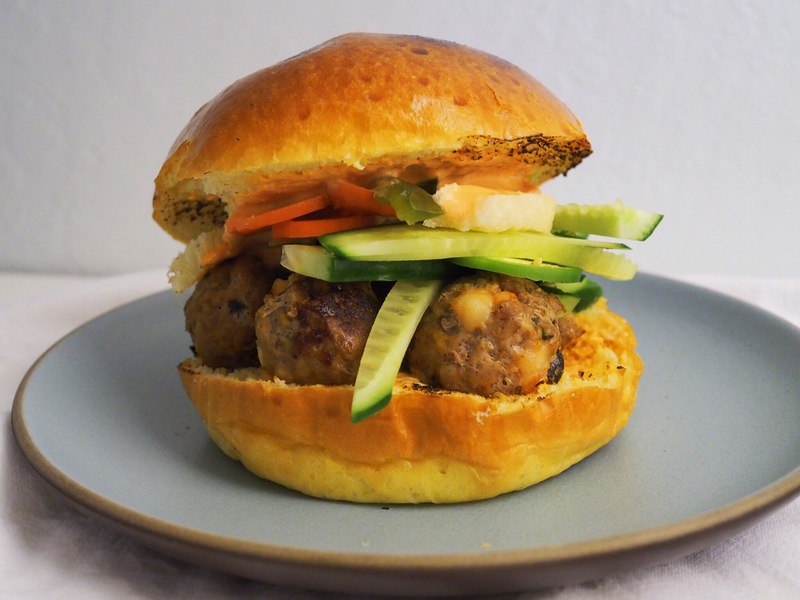 Bánh Mì Burger — Oh Wonderful! Did everyone have a nice Beyoncé Bowl Sunday? I know I did, and my bank account is ready to spend all of my money on Formation World Tour tickets. Aside from my queen dropping a new single, performing at the Superbowl, and making me cry from happiness, I also made this Bánh Mì Burger with pork and shrimp meatballs and Sriracha mayonnaise. It was pretty good, but definitely not as good as Formation. Instead of using the typical French roll, I went with an ultra-buttery Brioche bun from good ol’ Trader Joes’s which held up really well with the Sriracha mayo and steamy meatballs. It’s super simple to whip up, especially if you pick up pre-pickled carrots and daikon. A perfect take-to-work lunch or a quick, easy weeknight dinner. 1. Combine all ingredients in a large bowl and mix together. Don’t be afraid to put your hands in there! Preheat your oven to 450 degrees Fahrenheit. 2. Roll your ground pork and shrimp mixture into meatball-sized balls. 3. Bake in the oven for 15-20 minutes, or until done. 1. Toast your brioche buns until warm and slightly crispy. 2. Slather your buns with the Sriracha mayo on both sides (or be non-gluttonous) and only do one. 3. Layer on your meatballs, sliced cucumbers, carrots, and daikon. Sprinkle with a bit of black pepper and enjoy!